The rural eastern end of the county of Dorset was comprised largely of the area overseen by the erstwhile Wimborne and Cranborne Rural District Council. Two of the main operators serving this part of the world are described more fully on separate web pages, Victory Tours of Handley, and Toomer of Crichel. If we take as our area of research for the purposes of this web page an area of Dorset to the north of the A31, west of the A338 and south of the A354, we can identify several operators who played their part in earlier days, especially in the 1930s. Victory Tours, a long established Dorset business run by several generations of the Adams family, was based for many years in the substantial village of Handley in the far north east of the county. The origins of the business go back to 1921 when Cyril Adams acquired a Thorneycroft bus and brought it back to his home village, adopting Victory Coaches as his trading name. Their routes were established primarily in pre-war years and reached Salisbury, Shaftesbury, Blandford, Wimborne, Bournemouth and, for two years only from 1947, Ringwood. Most activity was concentrated on market day trips and Saturday shopper services, with the main Salisbury route gaining a daily service in 1948. Activity grew in 1952 with the take over of the tours and excursion business of J Robins & Son of Shaftesbury and their licences. Further growth came in April 1957 with a similar take over of the tours licences of W Otton & Son of Cranborne (who had been bus operators too until 1952). Ernest (Ernie) Toomer set up in business in the same year as Adams, 1921, operating from his home at Manswood. He used his one bus to provide a service from the Crichel villages and Witchampton to both Wimborne and Blandford. Until 1939 the Wimborne route ran on Tuesday and Friday and the Blandford route on Thursday and Saturday. In 1939 Toomer acquired the business of Richard Stedman of Moor Crichel whose service paralleled much of his own Wimborne route, but running every weekday. The two routes were combined in July 1939 and from that date the Toomer service to Wimborne was operated on six days a week whilst the Saturday service to Blandford was discontinued. An additional route operated from 1949 to 1953 to provide connections from the villages to Wilts & Dorset services to Salisbury. Little is known of the operations of Richard Stedman. He held licences for a twice daily (except Sunday) route from Moor Crichel (White Farm) to Wimborne Square via Witchampton. He was operating prior to the introduction of road service licencing in 1931 and sold out to Toomer in 1939. Frustratingly few further details have been found despite some years of research. Even the published Notices and Proceedings of the Traffic Commissioners do not help as each licence renewal was 'unmodified' and therefore required no information to be given. Another operator interacting with Toomer was Edward Henry Lyne of Tarrant Rushton, who paralleled part of the Blandford route. Again the operations preceded the introduction of road service licencing and a licence was held by E H Lyne for a service between Tarrant Rushton and Tarrant Monkton and Blandford. Fred Lyne took over from his father Edward in 1935. A timetable (handwritten) dated February 1937 shows Fred Lyne to be a man of diverse interests, "coal and coke merchant, carrier and contractor. 6 and 8 seater saloon cars and 14 seater coach for hire. Sand and gravel supplied. Tarrant Rushton. Phone Blandford 241". There were two return journeys each Thursday and Saturday, at timings not dissimilar to Toomer's. In 1932 Lyne took over the five days a week route of Reg Vacher of Stickland, who had run from Turnworth and Stickland to Blandford since the 1920s. However this route was really the wrong side of Blandford for Lyne and in 1933 it was transferred to another Stickland operator, Lewis Sprackling. For a short time, from September 1933 to June 1934 only, Lyne ran a Tuesday return journey to Wimborne Market from Tarrant Rushton, travelling via Tarrant Rawston. Tarrant Keyneston, Tarrant Crawford and Shapwick. This replaced the service of H L Palmer, the Shapwick operator, of whom little is known, but was not a success. Things might have changed for Lyne in 1939 when Toomer withdrew his Saturday Blandford service, but Lyne's services ceased at the outbreak of war. Lyne also had a Chevrolet TK1658 supplied to him new by Selbys of Parkstone, Dorset, in November 1928; it was last licenced to E H Lyne in 1933 as a lorry. The PSV licenced cars were big enough to carry small parties. Thanks to Michael Marshall and Roger Grimley for the vehicle information. H L Palmer of Shapwick is listed in March 1932 as the operator of two market day services from his home village, one to Blandford via Tarrant Crawford and Langton on Thursday, the other to Wimborne via Pamphill on Saturday. These originated in 1928 with Henry Thomas Hales and then passed to Palmer. The two routes were discontinued in November 1932, possibly they lapsed with the advent of Lyne's service to Wimborne. Turning back north again, the Otton business was based in the village of Cranborne. The timetable below shows the routes of Percy Otton t/a William Otton & Son. They were established by 1920 and are often remembered for their Commer bus with an illuminated sign. William Otton had been a grocery shop manager in Lyndhurst and bought the Beehive Stores in Cranborne by 1915. The grocery stores passed to Sid Otton and William expanded his interests to include transport. Percy Otton (born March 1896) took over the business from his father in 1933. Some of their fleet enjoyed many years of service with them. There was little change over the years, apart from fares revisions, eg the last one made in April 1951. The bus routes were withdrawn in late 1952 - perhaps when the Commer expired? - but they continued as coach operators for a few more years. Adams (Victory Tours of Handley) and Otton worked together on schools with some sub-contracting. The business was sold to Adams in April 1957, and one Bedford OB was transferred. Afterwards the firm continued as motor dealers in Cranborne, later Verwood, and then in modern times relocated to Old Sarum near Salisbury where they trade as Ottons Landrover. PR9313 Ford ? ? New July 1927 to Castle, Cranborne. May have been a taxi not a coach. Last licenced as a van in 1931. TK3228 Chevrolet new 25/7/1929 Withdrawn Last licenced 23/7/1939 as a goods vehicle with J.R.Thake, Creech Hill, Wimborne St.Giles. TK6988 Bedford WTB dual purpose new 10/1931 07/1956 20 seater, new to W.Otton & Son of Cranborne. Last licenced on 30/9/1955. Scrapped by Charles Trent & Sons of Parkstone. Thanks to Michael Marshall and Roger Grimley for the vehicle information. From an entry in the Motor Transport Year Book for 1937/8 we have the following: W.Otton & Son, The Garage, Cranborne. Operating Bus Services; also Excursions & Tours. Rolling stock, 2 Sun Saloons 20 Seaters (1 Commer & 1 Bedford); 1 Chevrolet 14 Seater Bus; and 3 Private Hire Cars. Another significant operator in this area from at least 1923 through the 1930s was Edward (Ted) Hastings Saunders trading as Sunflower Coaches, Camel Green, Alderholt. One of his vehicles was TK 2889, a Chevrolet LQ Charabanc (chassis LQ 54563). It was first registered on 17 June 1929 and was supplied new to by Norman Pitt & Co (the licence was refunded on 31 January 1940 to its last owner: Cyril.H.Thomas, Shelbourne Garage, London Road, Calne, Wiltshire). In 1934 the business relocated to Verwood and was then known as Verwood Motor Services. Saunders also held a range of tours and excursion licences with a widespread pick-up area including Verwood, Alderholt, Woodlands, Horton, Crichel, Gussage All Saints and Witchampton. All the operations passed to Hants & Dorset Motor Services in January 1937, with two Reo 20-seaters, MW7965 and MW5642. Various routes were operated, with a lot of emphasis on offering a range of travel opportunities to the villages in the Gussage All Saints - Wimborne St Giles - Cranborne - Alderholt axis. There was a licence restriction on all services limiting provision to two vehicles maximum per departure. There may have been a degree of competition between Otton and Saunders as both ran from Cranborne through Wimborne on the same two days a week (Monday and Thursday). Both charged 2/- single and 3/- return in the 1930s. Only Otton offered fares from the villages to Wimborne, Saunders having no intermediate fare stage between Witchampton and Bournemouth. Perhaps this was to protect Stedman's daily service from Crichel and Witchampton to Wimborne. Fridays leave Gussage 9.00 am, leave Southampton 6.15 pm. Journey time 2½ hours. by H&D - still the preserve of Adams Victory Motor Service from Handley, until introduction of the 97 in December 1948). Tuesday, Thursday, Saturday; 5 journeys Sundays. 5 journeys a day from Poole worked through to Salisbury and return. shoppers buses now gaining six or seven buses a day. The 98 would appear to cover some of the same ground as Adams Wednesday service from Handley to Ringwood (1947 - 1949). Adams had been recognised as having "rights" in Gussage All Saints as Hants & Dorset (shown in their timetable dated 12th June 1949) gave protection to Adams on Tuesday only at 9.46 am at Gussage towards Wimborne with route 97 "diverting via Amen Corner and not taking up passengers there". Adams came through Gussage on his morning run to Wimborne. It may have been the introduction of the through running 97 to Salisbury from 5th December 1948, passing Crichel Golf Turning between the Horton Inn and Gussage All Saints, that gave Toomer the idea of starting his Salisbury connecting service from nearby Crichel and Witchampton. including workspeoples journeys to and from Tarrant Rushton Airfield). Kelly's directories for the area list other carriers runs, most of which did not become operated as licenced motor services in 1931. They show the strong influence that the Tuesday market in Wimborne then had on the area. 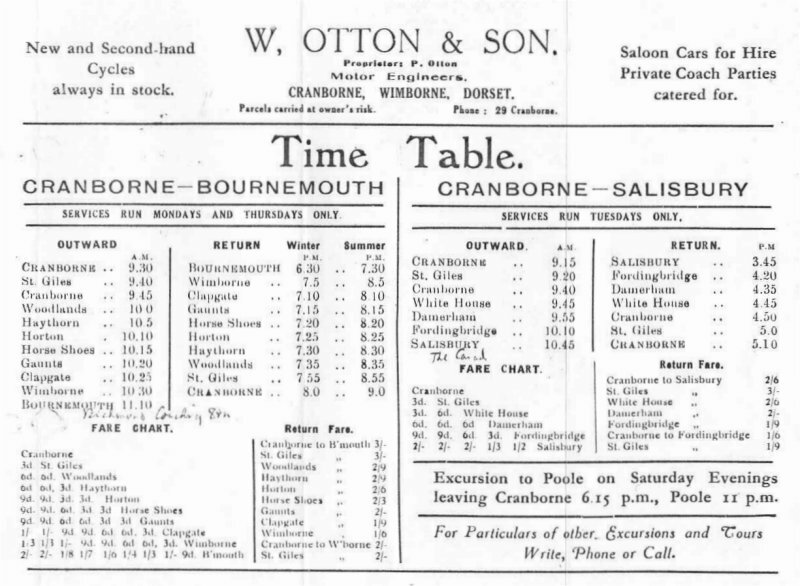 The entry for Cranborne from 1927 shows Sidney Wareham going to Wimborne on Tuesday; William Otton to Salisbury on Tuesday; and both E H Saunders and James Colborne going to Salisbury on both Tuesday and Saturday. The 1927 entry for Wimborne St Giles shows only E H Saunders to Salisbury on Tuesday, and the 1939 entry shows only Otton to Salisbury on Tuesday and to Bournemouth on Monday and Thursday. For Gussage St Michael the listings for 1927 and 1931 show Albert Snook going to Wimborne on Tuesday and Blandford on Thursday and Saturday. Gussage All Saints for 1927 lists George J Gubbins as serving Wimborne on Tuesday, whilst the entries in Kelly's for 1935 and 1939 show Frank Rowe as the operator of this service (although it is known he had ceased long before!). Woodlands for 1927 has Joseph Tubbs going to Wimborne on Tuesday, Friday and Saturday; for 1939 the entry shows Sidney Tubbs to Wimborne on Tuesday. Kellys for 1931 and 1935 lists Enos Walter Monckton as the Shapwick carrier, to Wimborne on Tuesday.